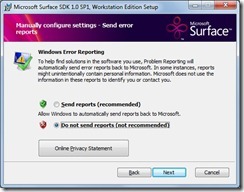 This is a follow up post to Surface SDK on Vista x64 where we got the original Surface SDK working on the unsupported Vista X64. 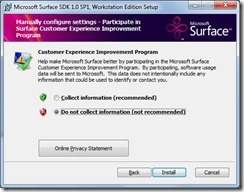 Last week Microsoft released Service Pack 1 of the SDK and there is an additional tweak that we need to get it going. Steps 2 and 3 haven’t changed with SP1 (we don’t need to “corflags” the new “stress” tool as it connects to the simulator rather than launching it), so jump over to the original post when you’ve got the SDK installed. Administrator access to the Vista or Win7 box you’re installing onto. Install Orca (link above, or just search for it). 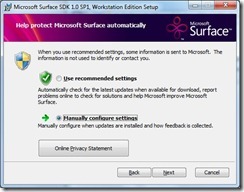 Copy the SurfaceSDKWE.msi to somewhere on your hard disk, and make sure that it’s not Read Only. 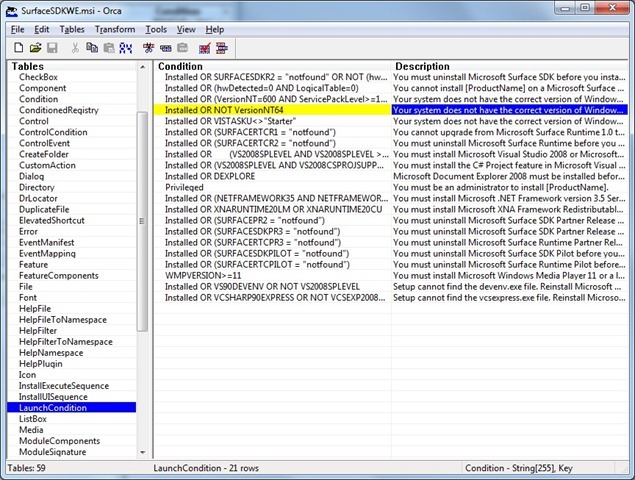 Select “LaunchCondition” in the left hand list, then select “Install OR NOT VersionNT64” in the right hand list (see below). Press delete and click OK when asked to confirm the row delete. 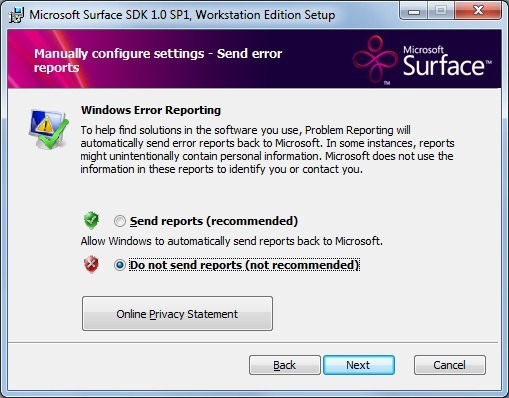 b) x64 is not a supported platform, so I’m sure Microsoft aren’t particularly interested in error reports! Now the SDK is installed, head over to the original post and follow steps 2 and 3 and you’re all done. Thanks to JamesK for his workaround comment on the original post. 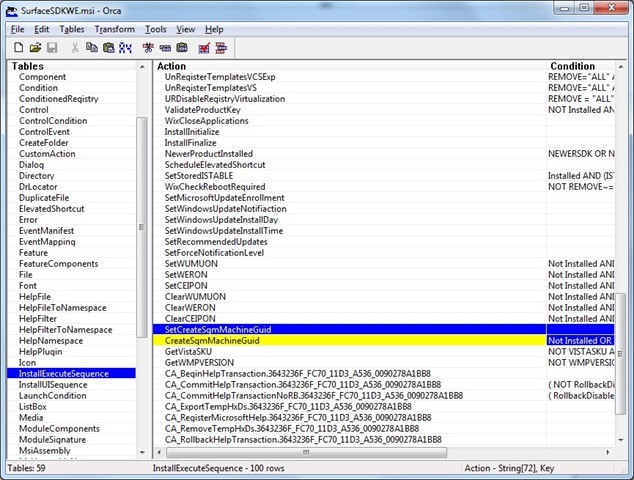 Update: thanks to Michael Zervos for letting me know that the academic version of the SDK comes in EXE, rather than MSI form. As he points out on his blog, if you keep an eye on your %temp% directory when you run the EXE it will extract the MSI for you to copy and patch. 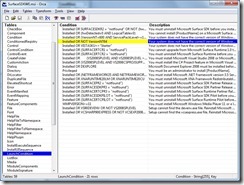 – Edit the configuration properties for the sample solution and create an x86 platform for all projects. 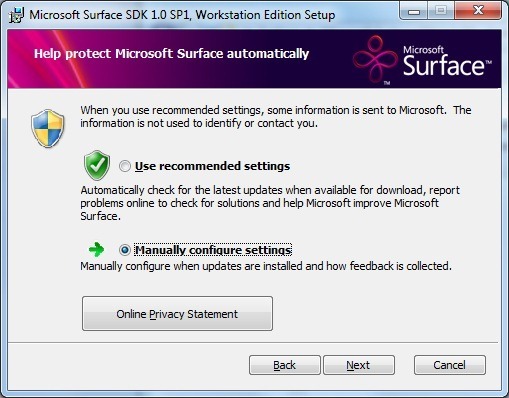 Tagged with sdk, Surface, vista, Win7, Windows 7, workaround, x64. Hey thanks for the solution. Thanks for the heads up Micheal – I’ve updated the post. 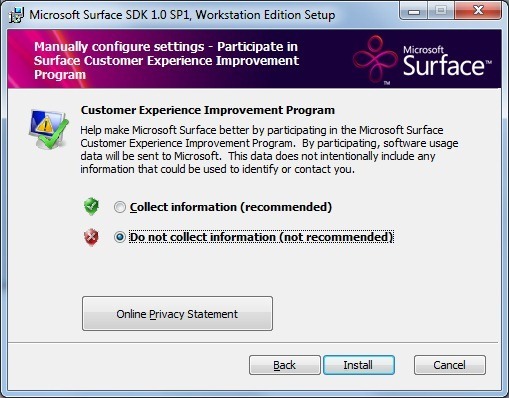 I have the Microsoft Surface SDK installed on my Windows 7 x64 machine, and everything works fine on it except the mouse. When I use the mouse the finger finger icon generated on the Surface Simulator is off by approx 100 pixels or so on the top and by 150 pixels or so on the right of the actual position where the mouse clicks at. Any Ideas on how to fix this? The only time I’ve seen something similar was with 3rd party mouse drivers. 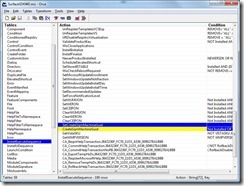 Do you have anything like Intellipoint or any other mouse utility installed? The only other thing to try is to turn mouse acceleration right down in control panel and see if that helps. Great Post. I have Windows 7 x64 and the instructions work perfectly. On my windows 7 x64 the installation progresses until it wants to write something to the registry, and then i fails.